The economic embargo has been the centerpiece of U.S. policy and strategy toward Cuba, but information and communications issues and measures have not been ignored. For example, after the embargo began, AT&T was allowed to maintain pre-embargo links through their existing undersea cable to Cuba. The power of information is also recognized in the Radio Broadcasting to Cuba Act of 1983, which established Radio Martí; Public Law 101-246 of 1990, on TV Martí; the Cuban Democracy Act of 1992, which called for improving telecommunications connections and information exchanges in order to increase the potential for change in Cuba; and the Cuban Liberty and Democratic Solidarity Act of 1996, which amends the Cuban Democracy Act in restricting communication investment. Communication technology and policy have increased in importance in recent years because of rapid technical progress and massive global investment in telecommunication infrastructure. Emerging computer networks are one, important manifestation of the growing importance of communication. Networks can improve the economic productivity, education, health, democracy and human rights, and quality of life of a developing nation such as Cuba . With this background in mind, we conducted a study of Cuban networks and related issues and policy implications . As background for that study, we investigated Cuban telecommunication infrastructure, which is described in this paper. We found that Cuba’s international links and capacity are sufficient for today’s demands, though more will be needed in the future, but that the internal Cuban infrastructure was poor and a bottleneck even today. The following sections discuss international and domestic telecommunication infrastructure and investment. Phone service between the U.S. and Cuba began in 1921 with AT&T’s installing an undersea cable between Florida and Cuba. 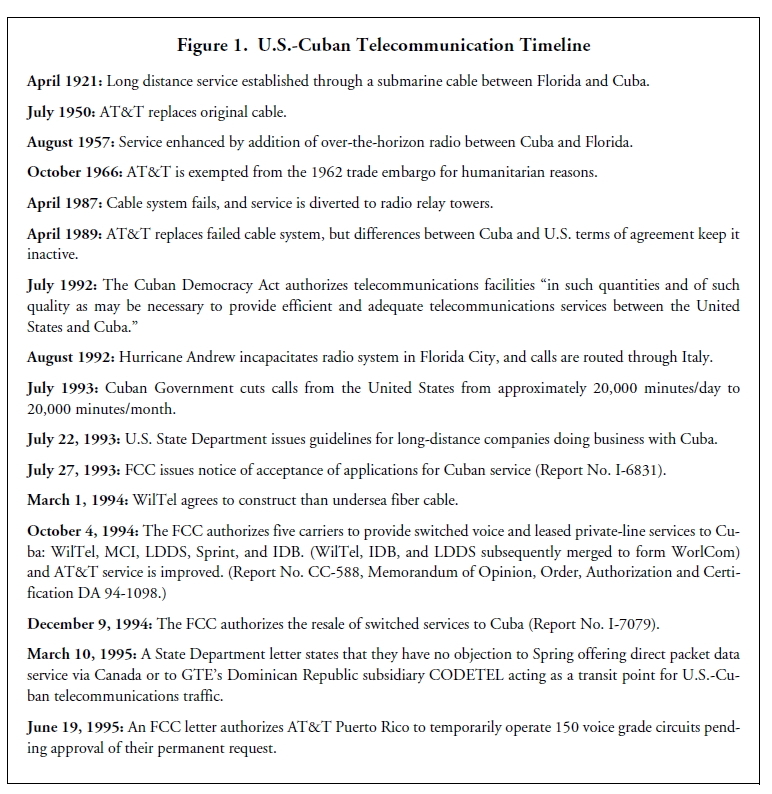 (The timeline in Figure 1 summarizes the history of U.S.-Cuba telephony.) After the embargo, AT&T was allowed to continue serving Cuba with the proviso that existing service continue, but new capacity not be added. AT&T deposited Cuban long-distance revenues in an escrow account. Calls from the U.S. were routed through an operator, and the FCC estimated that less than 1% of the 60 million annual call attempts were completed . Cuban pressure and the rapid growth of Canadian companies providing call-back service in the U.S., led the State Department to issue guidelines calling for increased service in compliance with the 1992 Cuban Democracy Act , which allows an embargo exemption in support of “efficient and adequate telecommunication services between the United States and Cuba.” Today we have direct dialing to Cuba and 953 authorized voice-grade (64 thousand bits per second, kbps) circuits. Of these 504 are in use. (See Table 1). U.S. company WilTel has applied for permission to construct a 210 kilometer, 2.5 gigabit fiber optic cable that would have roughly 41 times today’s combined authorized capacity. (John Williams, a founder of WilTel’s parent company, was born in Cuba, and his family had business there until 1956.) While this is clearly excessive capacity today, video traffic and an evolved Internet in an environment of normal U.S.-Cuba relations could absorb that and more. The WilTel application was made to the Commerce Department, which referred it to the State Department for an opinion. A positive opinion was given in November, 1994, and the application is back at the Commerce Department ]. WilTel says the cable can be in operation a year after they receive approval , but in the current political climate they do not expect rapid approval . Sprint also confirmed that they plan to offer leased, private-line service. Though they would not comment on price at this time, this would support full Internet connectivity if it could be afforded . There is also a $41 million joint venture between Cuba (51% ownership) and Italcable (49%) which provides long distance and international service through five portable earth stations in major tourist areas [8, 9]. I was unable to ascertain the capacity, but according to the Cuban Communications Ministry there are 1,109 total circuits. Italcable may account for the difference between this and the U.S. circuit count. Regardless, the majority of voice traffic is to the U.S. While there is unused capacity for today’s voice traffic, demand would increase dramatically if the trade embargo were revoked. Furthermore, today we have predominantly voice traffic, with little data transmission and fax services. A fiber cable would allow for video and other high-bandwidth data types and services. 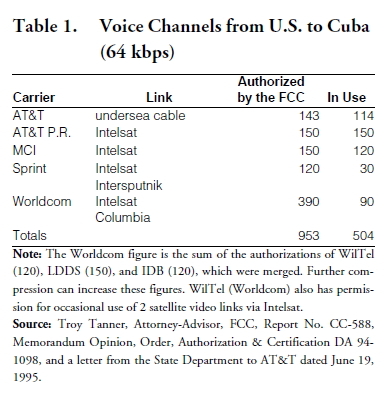 Still, for now, the internal Cuban infrastructure is a greater constraint on Cuban telecommunications than international connectivity. Cuban telecommunication infrastructure lags behind much of the world and the Caribbean region. 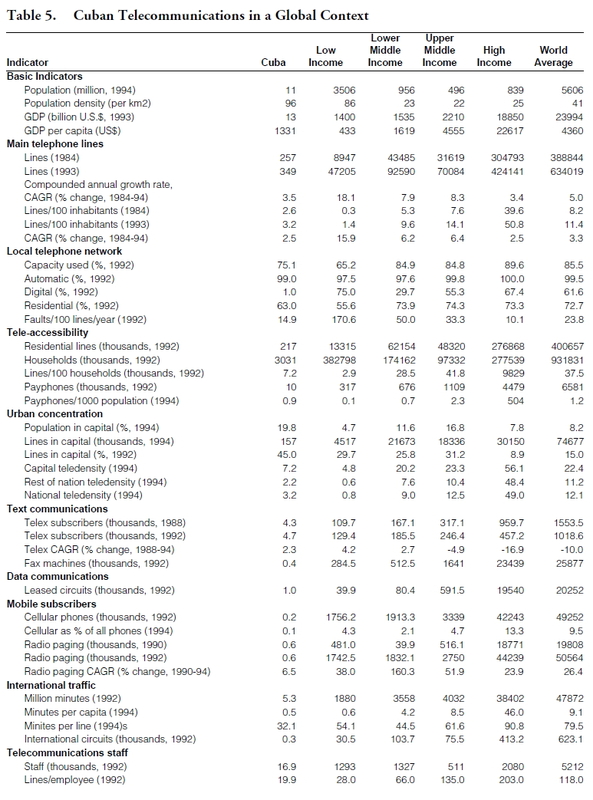 Table 2 compares the number of main lines 1 in Cuba with larger Caribbean nations and with nations in various income groups and geographic regions. Cuba has fewer main telephone lines as a proportion of population and GDP than any Caribbean nation but Haiti, and is closer to the low-income nations than the lower-middle group in which it falls. Armando Coro, a telecommunications expert and University of Havana professor states that “The U. S. embargo has had a devastating effect on Cuba’s telecommunications” . The interruption of supplies of spare parts from Eastern Europe after the Soviet dissolution and a lack of hard currency has exacerbated the problems. Table 3 shows that Cuba has added some main lines since 1992, but that growth is much slower than in other developing nations or the world. Enrique López, a principal of the AKL Group, a telecommunications consulting firm with wide experience in Cuba, reported that central office equipment dates back as far as the 1930s, and calls are very difficult to make. The poor infrastructure causes echo and disconnects and hinders both voice and fax calls . Haines  estimates that 40% of the Cuban telephone systems was installed in the 1930s and 1940s. Professor Coro confirms this, and states that Cuban equipment comes from Alcatel and Thomson-CSF (France), Western Electric and GTE (U.S.), Northern Telecom and Mitel (Canada), and L. M. Ericsson (Scandinavia), East Germany, and Hungary [19, 21]. This mix, the embargo, and a lack of hard currency make interoperability and maintenance difficult. There is a digital central office in Havana, identifiable by the “33” phone number prefix. These 33 numbers are available for dollars, and are used by phone company officials, foreign business people, diplomats, and so forth. 2 Cubans can theoretically have phones installed for an installation charge of 6.25 pesos, but in practice, they are not affordable by most. Those with 33 numbers can directly dial international calls, but others must request a call from an operator who places the call and calls them back when the connection is established. CIGBnet, and presumably other computer networks, pay for their domestic lines in pesos, but CIBGnet Technical Director Carlos Armas fears that may change. Some developing nations have been installing cellular systems as a substitute for decrepit landline systems. Cubacel is a joint venture partner with Iusacell ($8 million investment [5, 8]), owner of the Mexico City cellular franchise. (Iusacell is a publicly-traded subsidiary of Industrias Unidas, S. A.) Calls are routed via satellite through Italy. 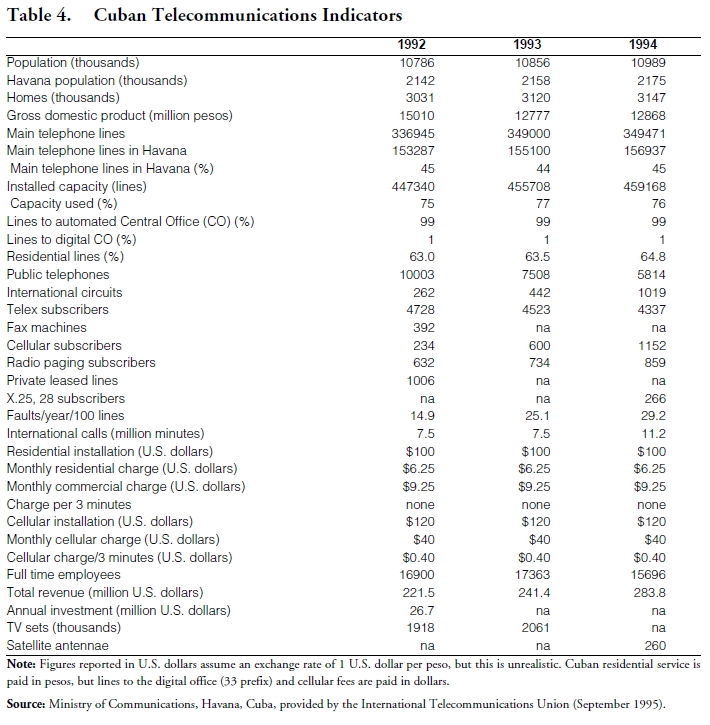 Demand is low, and as of 1994 there were only 1,152 cellular subscribers in Cuba (Table 4). Cellular charges are also in dollars. Table 5 shows overall Cuban telecommunication in a global context. In June, 1994 Domos, through their subsidiary CITEL (Corporación Interamericana de Telecomunicaciones), agreed to purchase a 49% interest in the Cuban phone system for a reported $1.5 billion . ETECSA was separated from the Ministry of Telecommunications, and established as a private joint venture. The Ministry regulates the phone system and sets rates, so one can assume there are close ties between it and ETECSA. Billed as the first large scale privatization in Cuba since the revolution, the agreement was announced during a one-day trip to Cuba by then Mexican President Salinas, who also took the opportunity to speak against the U.S. embargo. (Subsequent to his presidency, Salinas spent two months in Cuba.) In April, 1995, Domos announced “completion” of the purchase, and the sale of 25% of their interest to STET International Netherlands, N. V., a wholly-owned subsidiary of the Italian State Telecommunication Company for $291.2 million. ETECSA is jointly managed with 4 Cuban Vice Presidents, 3 Mexican, and one Italian. It will be interesting to see how the management of the operation and its relationship to the state evolves. Dolan  states that Domos is seeking further equity investment to reduce their share of ETECSA to 25%. According to Domos spokesman Héctor Cuéllar , ETECSA has a concession for 25 years (the first 12 on an exclusive basis) with two possible 12-year extensions to provide basic national, domestic long distance, and international telecommunication services, data transmission, telex, public telephone, trunked radio communication, subscription TV, paging, and other value-added services (all but cellular telephony). The agreement “valued” ETECSA at $1.442 billion, but promised investment “on the order of” $1.5 billion, including cancellation of Cuban debt to Mexico of $300 million. 3 Domos says they will invest an additional $700 million in the next 7 years for expansion and modernization of telecommunications, like the digitization of the network, refurbishing 200,000 existing lines, and expanding the network to a total of a million lines. The goal is to have 11 lines per 100 people (20 in Havana) in 7 years. Dolan  estimates that ETECSA already handles 20,000 international calls averaging 12 minutes daily. I made informal contact with an ETECSA employee who does not wish to be identified. He said there were plans for some renovation with digital switches in Havana, and that $3 million had been allocated for a 64kbps X.25 network. 4 The choice of X.25 instead of frame relay was the result of a lack of technical expertise. He also stated that generally nothing had changed within the company. There is still a lack of funds for investment in modern technical infrastructure, and no competitive approach. Top management is not market oriented. They are conservative, and trying to maintain the current voice infrastructure, rather than starting over from scratch in the data communication business with a market orientation. He also mentioned reports of a plan for a national satellite network in support of tourism, though he had no details. This would be designed for telephony, not data. At a Havana networking conference in May, 1996, it was announced that the X.25 network would have a 2 million bits per second (mbps) data rate in Havana (connecting each Ministry), and that Domos would be building fast microwave links to four provinces. This is a bit more than my anonymous reporter indicated, but substantially the same. Pérez-López  argues that while investments are important to Cuba, they may be of less than face value for a number of reasons. Several of these — multiyear disbursement, contingency of the investment upon future events, use of existing assets (in Mexico and Cuba) rather than fresh investment, payment for management of existing facilities rather than new construction, debt for equity swapping ($200-$300 million in this case), supplier credits rather than equity investments, and business delays— might apply in the case of this joint venture. An additional cloud hangs over the Domos investment. ETECSA has inherited assets of the nationalized Cuban Telephone Company, an ITT subsidiary, and ITT has an outstanding claim for $131 million against the Cuban Government . 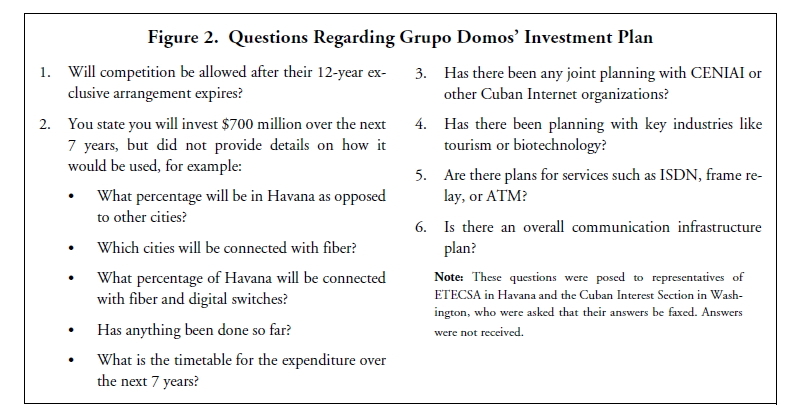 Domos received a warning from the U. S. shortly after the passing of the Cuban Liberty and Democratic Solidarity Act, and this may give them second thoughts and further hamper their effort to raise capital or find other equity investors. To summarize, the internal Cuban telephone infrastructure is obsolete and deteriorating. While investment has been promised, the details— questions such as those raised in Figure 2— are not specified, and Domos appears to be having difficulty making good on their promises. For some time, voice and data communication within Cuba will continue to be poor, and there may be opportunity for further investment. We have seen that Cuba’s international telecommunication infrastructure is in better condition and better able to meet current and future demand than their internal infrastructure. The U. S. has been a major investor in international connectivity, and plans more as the political situation allows. Demand for telecommunication is rising in spite of the economic effects of changes in relations with Eastern Europe and the former Soviet Union and the embargo. Key industries which generate hard currency, for example tourism and biotechnology, require communication, and their requirements are being slowly funded. Four Cuban networks have international Internet connectivity. They grew substantially during 1992-95, are significant by Caribbean standards [14, 15], and are working to connect their networks internally creating a Cuban “intranet,” which will eventually be permanently connected to the Internet (current links are dial-up only). A committee “regulating the policy on global information networks” 5 has been formed, and an Internet plan formulated . If the investment by Domos materializes, ETECSA will make significant equipment purchases. They may also find new equity partners who will supply equipment and service. In addition to basic communication equipment, networking equipment like routers will be needed, and could possibly be supplied by U.S. firms. At the very least, we should allow direct investment in the equipment needed to support the services we offer. For example, Alan Garatt, an MCI spokesman, reported that problems with Cuban infrastructure caused difficulty and a four month delay in establishing their current service . Bardacke, Ted, “Mexicans to Buy 49% of Cuban Phone System,” Washington Post (June 14, 1994). Beird, Richard C., letter from Beird, Senior Deputy U. S. Coordinator, Bureau of International Communications and Information Policy, U. S. Department of State to FCC Chairman Reed Hundt, October 3, 1994. Broyles, Gil, interview, July, 1996. Cuéllar, Héctor, telephone and fax. Dolan, Kerry , “Their Man in Havana,” Forbes (September 11, 1995), pp 60-68. FCC, Common Carrier Action, Report CC588, October 5, 1994. Garatt, Alan, telephone interview, August, 1995. Haines, Lila, “Cuba’s Telecommunications Market,” Columbia Journal of World Business, 30:1 (Spring, 1995), pp 50-57.
International Technology Associates, “Market Trends,” Latin American Telecom Report, vol. 3, 1 (January 1, 1994). Lockman, Laura, State Department Desk Officer, telephone interview, August, 1995. López, Enrique, telephone interview, August, 1995. Pérez-López, Jorge F., “A Critical Look at Cuba’s Foreign Investment Program,” Meeting of the Latin American Studies Association, Washington, C., September 28-30, 1995. Press, L. and Snyder, J., “A Look at Cuban Networks,” Matrix News 2(6), Matrix Information and Directory Services, Austin (June 1992). Press, L., and Armas, C., “Cuban Network Update,” OnTheInternet (January/February 1996). 46-49. Press, L., “The Role of Computer Networks in Development,” Communications of the ACM, Vol. 39, No. 2 (February 1996), pp 23-30. Savageau, John, R., email interview, October 1995. Scaefelen, Steve, “A Different Kind of Revolution,” In Perspective (Summer 1994). The Mexico Report, Vol. 5, No. 10 (June 3, 1996), http://l-r-i.com/mexrpt.html, info@l-ri.com, (202) 363-8168. Larry Press is Professor Emeritus at California State University, Dominguez Hills, and author of a blog on the Internet in Cuba. He has worked on the Internet in developing nations since 1990 and wrote his first paper on Cuban networking in 1992.